The following is preliminary research I did to test out Synchrotech's CFMulti with and Eye-Fi card for use with my Canon S-70. After posting a concern about Gambit inserting an additional "version" directory into the installation path, the following was suggested on the Gambit mailing list and works perfectly. When executing make install set the PACKAGE_SUBDIR="" to remove the version number from the installation path. $ make install prefix=/usr/local PACKAGE_SUBDIR=""
This places the Gambit files in the directories I expect them to be in. Recreation of Sun's Java example program to create RSA and DSA keys from the command line in Kawa Scheme. The code utilizes the following Kawa functionality: 6.4 Compiling Scheme to a standalone application, 10.4 Calling Java methods from Scheme. 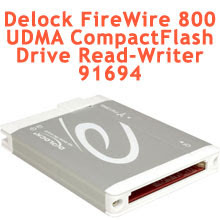 When EverythingHerePlus.com released their CFFire800 Pro reader for CompactFlash cards, I was waiting for them to add a FireWire 400 option. Since I switched from my Pismo PowerBook to an iMac G5, I have had to download photos to iPhoto over the Canon S70's slow USB connection. 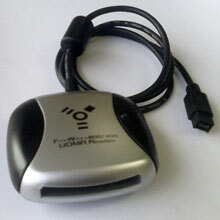 I have been waiting for an affordable FireWire reader ever since. EverythingHerePlus.com's CFFire800 Pro FireWire 800 to CompactFlash Drive Read-Writer has a 9-pin FireWire 800 plug and I couldn't find a converter plug. Now EverythingHerePlus.com is offering such a plug for those of us that need to use the lightning fast reader with FireWire 400. 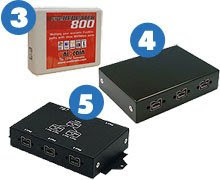 Their FireWire 800 9pin (female) to 6pin (male) Converter Plug allows use of the CFFire800 Pro for the rest of us. From everything I have read, and my own testing so far, this reader is much faster than USB 2.0 models even when used over FireWire 400 (IEEE 1394a) mode. Getting The Kawa language framework to build on OpenBSD is fairly straight forward. You just have to call gmake instead of make. One of the advantages of working in the technology field is the opportunity to test new items. I recently was asked to test Synchrotech's ExpressAdapt product over a weekend with my PowerBook G3 (Pismo). The test application was an activated engineering sample of Option Wireless GT Max 3.6 Express. Synchrotech's ExpressAdapt was developed to handle mixed voltage ExpressCard better than competing devices, so getting the GT Max to work on an 8 year old notebook was actually possible. The nicest thing about the ExpressAdapt CardBus to ExpressCard Adapter is it required absolutely no drivers under OS X (I am running Mac OS X 10.4.11). The system recognized when plugged in the PC Card slot without any hesitation. Locating software and configuration settings for the Option Wireless GT Max 3.6 Express was a little more work, but once done, the ExpressAdapt card allowed it to behave on the PowerBook G3 as if had been made for it. While 3G (HSDPA) wireless isn't all that fast, particularly in my neighborhood, it is nice to be able to try a technology in use on all the newer machines on an older Apple PowerBook. At $45, ExpressAdapt allows the use of any USB based ExpressCard in PC CardBus (32-bit) notebook slots. On the same weekend, a friend dragged over his new notebook with The Vista, and his T-Mobile Wing and asked me to tether them. I found some instructions on the internet. I know the predatory monopoly capitalist is trying to re-market their failed OS, but just ten minutes of hands on showed me why people are rejecting it. It literally took more steps (various phishing notices, redirects, warnings, license agreement screens, more warnings, etc.) to download The Vista version of ActiveSync than it did to tether the phone. How people put up with such poorly thought out and executed software from Redmond is beyond me. I did get his system tethered and he was happy.